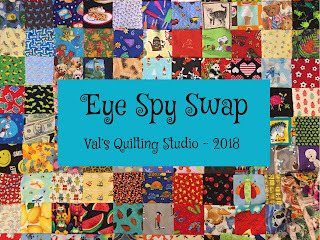 Val's Quilting Studio : 2018 Eye-Spy Swap is CLOSED! Hey Guys! What better way to collect 200 different Eye-Spy fabrics than by swapping with our fellow blogger friends. Welcome! This is the official opening post for sign-ups! 1. Swap Spots: This is a double swap. You can sign up for a maximum of two spots...but the fabrics for each spot needs to be different. Each spot gets you 200 squares, enough to make an Eye-Spy Quilt that is a about 46" x 48" . There are 36 spots available. This swap is closed. 2. Yardage: Each spot will find you committing to buying or destashing and cutting a 1/4 yard of 10 different I-Spy fabrics. 4. Flickr Group: In order to avoid duplicates,have fun search for those unusual and obscure prints then upload pictures of your fabric choices to the 2018 Eye-Spy Flicker group as soon as you can. Also, you can check the group before purchasing too. If you are unable to post to the Flickr group, email me your picture and I will add it. 7. Stacking: Then please stack your 20 piles together once they have been sorted using a piece of scratch paper between them. Do not put individual piles into individual baggies. Click HERE to see what your stacks should look like. Send me that email and grab the "button" below to help spread the news to your blog readers. Hopefully I didn't miss any details. You are welcome to email me with any questions. I'm in. Sending you an e-mail shortly. This is one I cannot play, but will be watching all the fun. I can't join the fun this time because I'm still in Australia. But I look forward to reading all about it! I won't make it in time to participate in this swap. durn I am very interested in your longarm services since I am in No. CA and just one state away. My first quilt I sent to a longarmer back east and had to pay some high shipping costs to and fro. Got you on my Feedly now so I won't miss your next hosted quilt event.